The original ATK of this Normal Summoned card becomes 1000. (Quick Effect): You can Tribute 1 DARK monster; reveal 3 Normal Traps from your Deck, your opponent randomly picks 1 for you to Set to your field, and you shuffle the rest back into your Deck. You can only use this effect of “Lilith, Lady of Lament” once per turn. Lilith, Lady of Lament starts off our look at the Lair of Darkness Structure Deck. Level 3 and below monsters can’t have high ATK without a drawback, and this one is the same. 2000ATK, but cut in half when Normal Summoned. Despite that, it still means you get a 2000ATK Level 3 under Skill Drain or a Special Summon. Pop a DARK monster and get a Normal Trap out of 3 you reveal from the deck. This is meant for “Virus” Trap searching, but with traps like Torrential and Bottomless able to be run at 3 again, the possibilities have grown to abuse this effect. Yes, your opponent knows what you have then, but that doesn’t change them facing down a Virus or a Torrential. Combine this card with the Field Spell and you get a tribute of an opponents monster for Lilith’s search effect, sounds like a win-win to me. It is a solid search effect if you are playing a lot of Normal Trap cards, and even if you are playing only a few, it is still a search. She can tribute herself as well, so at the least you’ll break even. Good card that helps search for the cards she’s geared to, but could be dropped into a DARK-based deck running Normal Trap cards. The meta isn’t only Solemn this and Solemn that (despite the Solemn brigade in full force now). Lilith, Lady of Lament is pretty good at being a Dark Level 3 Fiend-type monster with 2000 Atk and 0 Def. When Normal Summoned she drops to 1000 Atk. She also can tribute a Dark monster including herself to make your opponent pick a random Normal Trap Card from your deck to Set on the field out of 3 that you reveal. It’s once per turn and the rest get shuffled back into the deck. In Lair of Darkness you’ll probably be able to tribute an opponent’s monster and use Lilith for one of the Virus Traps. The inability to search any trap makes her slightly less useful in other decks, but Lilith is still an excellent combo piece. The whole deck gets recked by Mask of Restrict though. It is very rare the site reviews cards that are currently in the OCG and have yet to get their TCG prints, but here we are looking at cards that will be in the Lair of Darkness Structure Deck that is released in the TCG on April 20th I believe. The first card will be one of the two Ultra Rares of the deck: Lilith, Lady of Lament. Lilith is a Level 3 Dark Fiend with 2000 ATK and 0 DEF. Level 3 Fiends are always great thanks to Tour Guide from the Underworld. 2000 ATK is rare on a Level 3, so I will discuss the restriction in a bit. 0 DEF is fine since this allows it to have synergy with our Throwback Thursday card. If Lilith was Normal Summoned, its original ATK becomes 1000. Yeah, I didn’t expect them to let you Normal Summon a Level 3 with 2000 ATK without something like that. 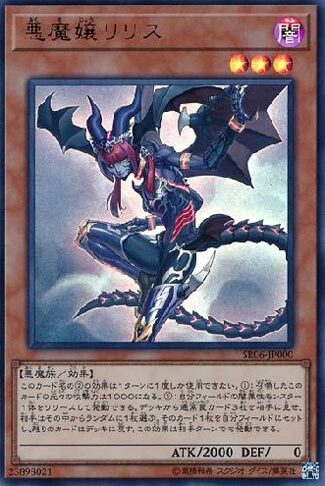 With this though, Lilith can now work with both Crush Card Virus and Deck Devastation Virus, and Konami has shown their intentions to use Virus cards with the new Dark monsters, hence all of them will be in the deck along with a new one. As a quick effect, you can tribute a Dark monster to select 3 Normal Traps in your deck, your opponent will randomly select one to be set while the others go back to the deck. Nice quick way to get to your Virus cards, but also it can get a new Trap card in Infinite Transience that will likely be a staple in the TCG when it comes out in Flames of Destruction. Lair of Darkness, the Field Spell in the deck that we will talk about later this week, will let you use this effect and tribute a monster your opponent controls, and since this is a quick effect, this could disrupt a play while giving you a powerful Trap. Lilith is a great card and you will likely be playing this if you want to mess around with the new Dark monsters. The tribute to get a Trap is a hard once per turn, so don’t think you’ll be getting tons of Traps with this with the greatest of ease. Art: 4/5 She honestly looks very sinister, perfect for this deck. Oh look, a card in Japanese! Lilith (for anyone who is/was a fan of the show Frasier, you’ll enjoy the deliciousness in the name for an extra second) Lady of Lament (as well as the latter part of her name) Anyway, this card, in itself, is fairly difficult to review. It’s a tremendous combo card, rather lackluster on its own. Coming from the new Structure Deck, Lilith has a meaner, bigger, stronger, older brother. They work well in tandem together, and not so well alone. The 2000 attack this Monster has (in addition to being Dark) works well with the Virus cards, as well as the new one in the Structure Deck. The Virus card part is important as via the effect of this card, those are likely the Traps you’re going to select, in whatever combination. Worth noting too, 2000 attack on a Level 3 is just absurd, so that only holds via Special Summon. Normal Summon cuts it to 1000 BUT that’s not bad either. It still fits in working with the Virus theme with the lower attack. The more cards you have working with this card, the better it gets, and she’s not terrible on her own. You may only need the Trap fetching effect once, so it shouldn’t be a huge deal to keep her on the Field.